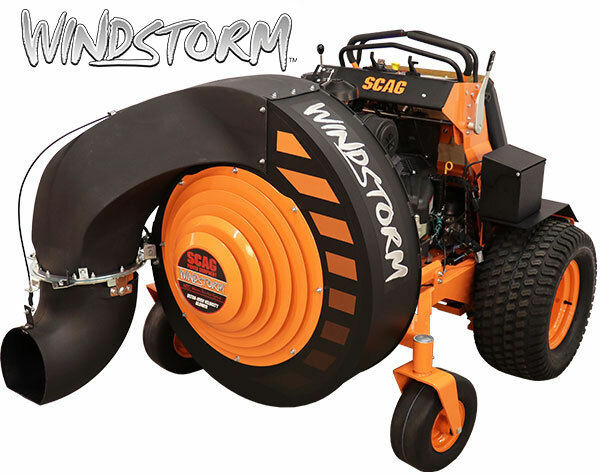 -Scag Exclusive NDS (Nozzle Direction System) provides unprecedented control of the air discharge tilt and rotation with two fingertip control. Adjust the horizontal rotation up to 180 degrees and the vertical tilt up to 16 degrees. -Massive air output of up to 6,000 effective CFM* (7,500 theoretical peak CFM*) provides incredible ground clearing force on a variety of surfaces and applications. -*Effective CFM: Calculation obtained by applying accepted engineering methods of measuring overall average airflow volume. This is the default figure published by Scag for all its blowers and truck loaders. **Theoretical Peak CFM: Figure derived by assuming the highest single-point measurement obtained during testing would apply to the overall airflow volume calculation. This figure is published by some other brands of stand-on blowers as their default "CFM" measurement. 8-blade dynamically balanced and fully fabricated steel impeller with taper locking hub. 15" front air intake and rear intake supply allows the impeller to draw the needed air volume for optimum performance. Aerodynamically designed to optimize air intake without causing turbulence. Up to 10.5 MPH forward speeds and up to 5 MPH reverse speeds keep productivity at a maximum. 37HP Briggs Vanguard EFI is an incredibly powerful and efficient powerhouse. Ogura GT 3.5, 250 ft.lbs. PTO clutch brake engages and stops the impeller smoothly and safely. Adjustable air gap ensures long component life. Ogura Clutch features Softstart Controller to ensures smooth engagement, reducing wear and shock loads to the belts and associated mechanical parts. The Soft Start System also eliminates potential engine RPM droop which could lead to engine stall. Convenient, full-featured instrument panel has Nozzle Directional System, Tiger Eye: Advanced On-Board Monitoring System, ignition key, PTO switch, and throttle. The fuel gauge is located on top of the fuel tank, right next to the instrument panel for easy viewing. Dual 12cc hydraulic pumps and dual 14ci cast iron, high-torque wheel motors provide smooth, positive and reliable power to the drive wheels. Pressure relief valves in the pumps protect the system from internal pressure spikes and add to pump life. 8 gallon fuel tank keeps you in the field tackling debris. Fuel tank features a fuel level gauge and an extra large, angled filler neck for easy filling. Auxiliary canister air filter system comes standard equipment. This provides extended service intervals and longer engine life. Split steel idler pulley is stronger than cast iron or stamped pulley designs. Our pulleys are strong for long life and lightweight for reduced inertia and decreased wear on the drive system. Extra-large drive tires ensure better traction, less turf tearing and easy curb climbing. Drive tires are 4-ply for added durability. 24x9.5-12. Flat-Free front caster tires eliminate the downtime associated with flat tires caused by debris, thorns, etc. 13x5-6. Four tie-down points are built-in on the front and rear of the blower (2 front, 2 rear) for fast and convenient loading and unloading on trailers. User-friendly machine design allows access to the engine and filters, for easy maintenance. Engine oil drain hose included. High quality electrical components such as switches, wiring and harness looms are used throughout the Scag product line for dependable service. The Scag "Simply the Best" commercial warranty stands behind you and your machine for years of profitable service.